"LOVE, SWEET LOVE!" - let's add a twist to our usual February love cards and add . . . chocolate! Incorporate a chocolate element into the card. I saw 'chocolate' and immediately thought of donuts. HA - there is no reason for this, as if I ever DO get a donut, it's typically the honey glazed and not a chocolate glazed or chocolate donut. At any rate, since I had donuts on the brain that is what I went with for my card. 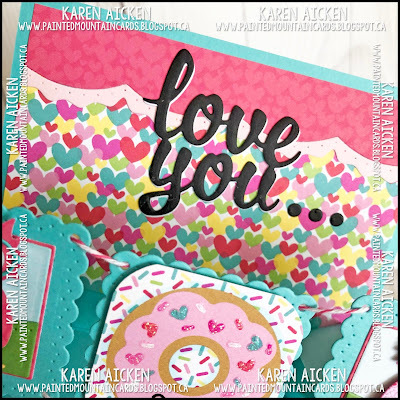 I used the new Border Blends Party as well as the 'You're Sweet' ... since donuts are sweet, right? I also kept the front nice and simple because all the FUN is on the inside. 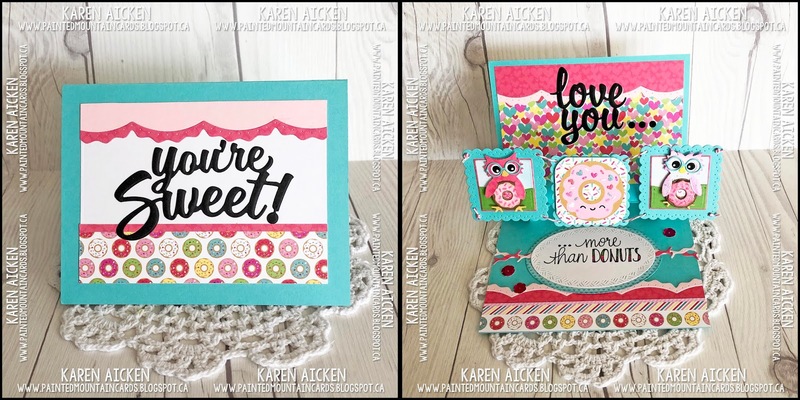 I always say that all the dies by Karen Burniston 'play nicely together', so I combined some of the new release with some older dies and everything goes together seamlessly. Love that. The Upsy Daisy Pop-Up gives a lot of dimension, and it's always such a fun surprise for the recipient to see the dangling centre rectangle. I added more of the Border Blends Party to the inside top, as well as the new 'Love You'. I used black card stock and the owl's eye die for the black 'dot dot dot' at the end of the 'love you so the greeting inside reads "Love You... ... more than DONUTS!" . I added two owls from the new Feathered Animals, one on either side square. Each one looks a little different as I added the extra feathers to the right owl's head and lengthened the feet on the left owl. They are each holding a donut from the Sweet Treats Charms and I added Nuvo Crystal Drops so the entire icing part is raised and shiny with a touch of glitter. I also inked the edges of the kraft donuts so they would look more like chocolate donuts. The donut embellishment on the centre was actually fussy cut from a piece of patterned paper from the stack. I added the same Nuvo Glitter Drops to the hearts and sprinkles as well as a black glaze pen detail on the eyes and mouth so they are nice and shiny. I penned the 'more than DONUTS' with a black marker on one of the Crosshatch Ovals, and plan to write 'even the chocolate ones' when I go to send the card. For some added interest, I twisted together two of the 'twigs' from the Border Blends and added some pink foil sequins. The sequin die comes with the Rockin' Rectangle, which is also part of the new release. Below is a side view so you can see the pop-up a little better. Finally, for those that like to add 'fronts and insides' to your Pinterest boards ... here you go! Be sure to check out all the SWEET projects from the rest of the Design Team -- their blogs are linked on the right. 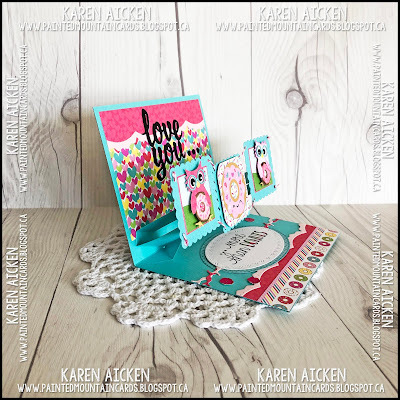 Karen Burniston will have her card and a group post on her blog tomorrow (Wednesday).